Randy Ramos, a recruiter at the Spokane Tribal College, says education is an "escape." Sometimes, Randy Ramos recruits at powwows. Other times, he sets up at the House of Charity homeless shelter. Or maybe the Community Court, where nonviolent offenders are given services instead of just jail time. In each place, Ramos delivers the same message: Education will set you free. "It's an escape. I tell them, if you've had a life being the victim, this is the opportunity to stop being that," Ramos says. "I had my family taken away from me. I had my job, had my money taken away. But my education can never be taken away from me." It's why he volunteers as a recruiter with Spokane Tribal College, an inexpensive two-year college aimed at native students. Haven't heard of it? That's exactly what Ramos is trying to change. He doesn't just recruit American Indians — the college is open to everyone. But when he does, he understands their story. Ramos is a member of the Colville Tribe. He wears his vivid family colors in a set of woven hoop earrings. He grew up in Spokane, lived in the impoverished Hillyard neighborhood and attended Rogers High School. For more than a decade, he worked at casinos. But after his gambling addiction went awry and he separated from his fiancée, Ramos ended up, humbled, on the impoverished Spokane Indian Reservation. There, he saw poverty and despair. He, his dad, his grandfather and two of his kids crammed into a single camper. He remembers a man joining his work crew, trimming trees in the Wellpinit woods. The very next day, that coworker didn't show up. He'd committed suicide. "I said to myself, something's got to change," Ramos says. "We need to educate our young. We need our own lawyers. We need our own doctors. We need our own professionals. We need people to run our own businesses." That's what made him decide, in 2012, to go back to school to become an educator. His first attempt, at Spokane Falls Community College, failed years ago. But the Spokane Tribal College, with a campus on the reservation and in Spokane, was a perfect fit. "Many of our students do start at other institutions and in two weeks, they're out," says Shelly Wynecoop, director of the college. They feel alienated. But at the small-scale Spokane Tribal College — where American Indians aren't outliers — there's a strong sense of community. After graduation, Ramos became a recruiter. He emphasizes the Tribal College's closeness: In some colleges, it's sink or swim. Here, they do everything they can to help you float. "You're going to graduate with me," Ramos says. "If you need to go sit in line at [the Department of Social and Health Services], and you don't have time, I'll go do that. If you need a ride to school, and your car broke down, I'll be going to go pick you up." Budgetary challenges meant that he was laid off this June. But he's still recruiting without pay. Wynecoop nominated Ramos for the Peirone Prize, not because of any one big moment, but because of his tireless work on countless little things. "It is just filling out 400 million pieces of paper. And it is just making 500 phone calls. And it is just grunt work," says Wynecoop. "But he keeps doing it. He keeps getting up every day and doing it." He almost single-handedly put together a dinner and art auction fundraiser so successful, it's become an annual tradition. He's been in conversations with Spokane Public School administrators about finding a new space for Medicine Wheel, a resource for native students in Spokane Public Schools. He's part of a group seeking to create a Public Development Authority through the city of Spokane to build a cultural center for urban natives. On top of all that, he's working as a life-skills coach at the Healing Lodge of the Seven Nations, a drug treatment center for native and non-native youth in Spokane Valley. I give back because: I know that, if I can do that for one person, maybe they can reach out to another person. If I can touch three or four people, maybe they can reach out and do the same thing. A little splash can turn into a big wave. 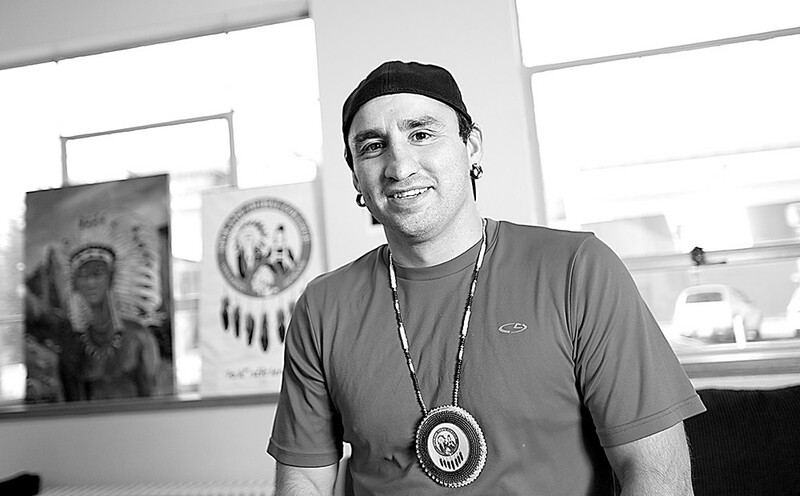 I look up to: [Medicine Wheel Academy teacher] Dave BrownEagle. Dave's always been one who says, 'Take care of each other, look out for one another.' My dad: he's got one of the biggest hearts I've ever seen in a person. I've literally seen him take his shirt off his back and give it to somebody else in the middle of a blizzard. I hope I can hold a candle to him in that way. My mom raised me as a single mom: She gave herself every single day to make sure I had a roof and clothes on our back. I wish: that everybody will come together and recognize that we're all in this together. That they'd love each other no matter what their background is, no matter what their story is. That'll open up a lot of doors.